Trellises provide an attractive way to create barriers and partitions within a garden. Trellises can divide the garden into distinct areas, enclose the entire garden space or provide extra cover along a fence or wall. Flowers and vines grown on a trellis provide not only privacy, but also protection from wind and wandering animals. Many plants thrive when trained to grow along a trellis. This method can also be used with many vegetables to encourage upward growth and increase yield. Install the bare trellis in your garden or yard. The base of the trellis should be firmly inserted at least a foot into the ground to keep it standing and ensure that it can support the weight of plant growth. If you prefer a freestanding trellis, select one in the shape on an A-frame or tee-pee. This type of trellis must still be sturdy enough to support the plants that will grow on it. 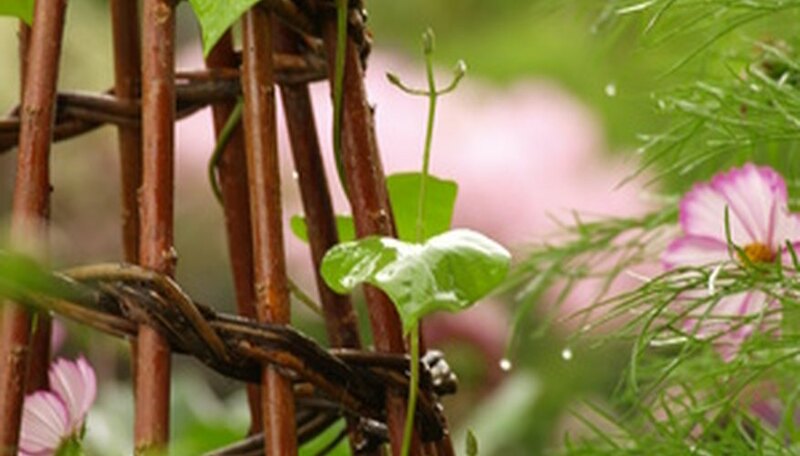 Select a plant appropriate to trellis gardening. Climbing vines and many vegetables are ideal for this type of feature. Honeysuckle, Virginia creeper, sweet peas, roses and wisteria will all grow well on a trellis. Vegetables that can benefit from trellis gardening include peas, tomatoes and pole beans. Dig a hole for the plant that will be growing on the trellis directly in front of it. If the trellis will be supporting only one plant, make sure that this hole is centered in front of the trellis. If you have a larger trellis that will be supporting multiple plants, space them out evenly along the width of the trellis. Train the plant to grow up the trellis. Affix trailing branches and vines to the trellis with plastic twist ties to encourage upward growth. Trim back growth at the base of the plant using garden shears to direct energy for growth up toward the climbing vines. When & Prune Grape Vines? What Are the Best Plants for a Trellis?